ECHU CABLE is a professional manufacturer integrating production, sales and service together, which produce cable to meet the requirement in Special occasion and normal occasion. Our main products include: Drag chain cable and robot cables; Industry cable and data cables; Flexible cable and control cables; Elevator travelling cable; Crane cable; Flat crane travelling cable; Shield cable; Electrical cable; High frequency coaxial cable; Drum-reeling cable; Security cable and so on. ECHU cable is to integrate scheme with complete solution for industrial and mining enterprises, industrial equipment and industrial unit, Industrial Automation. After years of development, ECHU cable is universally acknowledged with super before-sales service, positive products' quality guarantee and complete after-sales service. 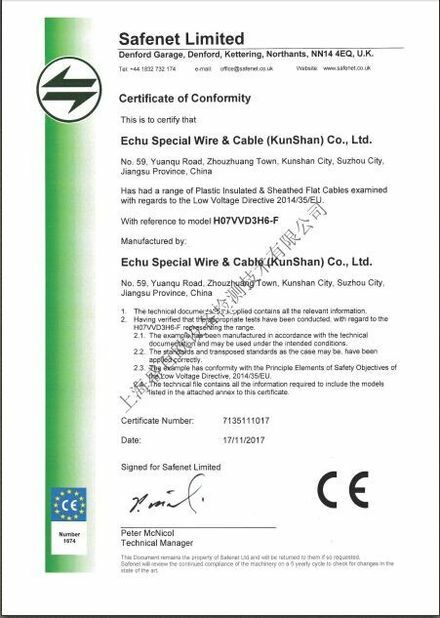 ECHU cable has been awarded the certificate of Chinese Top 10 Brand of Wire and Cable and Chinese Top 500 Enterprise of Quality by Chinese Product Quality Inspection Commission and Chinese Product Recommendation Commission. ECHU is also been invited to join Shanghai Wire & Cable Industry Association and Shanghai Contract Credit Association. On that basis, ECHU people study harder and explore & develop constantly. ECHU cable builds its own team through absorbing advance design philosophy of LAPPKABLE, TKD, IGUS, HELU, BELDEN, NEXANS and other international famous cable Enterprises; Inviting Top Technical Talents and specialist; Cooperating with Harbin University of Science and Technology, Shanghai Jiao Tong University, Shanghai Electric Cable Research Institute and many other famous universities and study institutes. At the same, ECHU Company puts in much money to research and develop high-end cable products, build our own brand -ECHU® CABLE which enjoys very high fame in cable Industry. 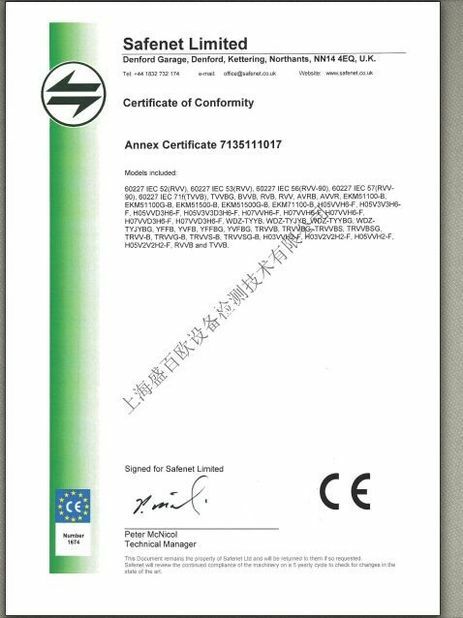 In March, 2011, especially drag chain cable has won the National Utility Model Patent, which apply in standard spare parts of modernize machine. ECHU continue to perfect the international high-end cable to change into Chinese cable with excelsior concept, the more excellent quality and moderate price. As a modernized enterprise integrating both manufacturing and distributing, ECHU is shaped by headquarter, factory and branches across China. The factories locate at Pudong District of Shanghai, Zhouzhuang town, Kun Shan city of Jiangsu Province. ECHU has established a strict quality control system which includes technical, checking, quality control department, Logistics department, after-sale service and other departments. At the beginning of establishing the company, ECHU got the ISO9001 international quality system standard legalize. In order to make our products strictly meet quality standard, all ECHU products have obtained CCC, UL, CE, VDE certificates, and the quality has reached advanced level abroad and at home, even surpassed. ECHU is combined by Purchasing, manufacturing management and technical development and product quality management, production sale service, logistics distribution, after-sale service and other departments. Talents who are involved in management, technology, marketing and production work for ECHU. 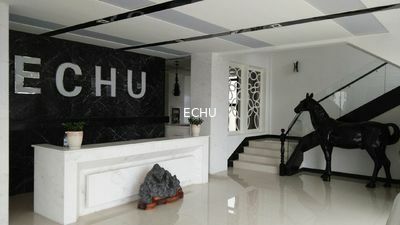 ECHU people will offer you meticulous and close service in every process of our business, from inquiring, purchasing, production schedule, receiving the products and using products. ECHU people will always bear Concept of ECHU in mind -honest, remarkable, grateful and conscientious. Sincerely welcome you from domestic or abroad to contact with us, ECHU will offer you first-class products and services. 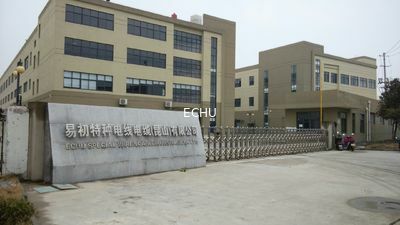 4 Since 2010, we build our another factory in Kunshan, named ECHU Special Wire & Cable (Kunshan) Co., Ltd. Drag chain cable and robot cables; Industry cable and data cables; Flexible cable and control cables; Elevator travelling cable; Crane cable; Flat crane travelling cable; Shield cable; Electrical cable; High frequency coaxial cable; Drum-reeling cable; Security cable and so on. ECHU cable is to integrate scheme with complete solution for industrial and mining enterprises, industrial equipment and industrial unit, Industrial Automation.